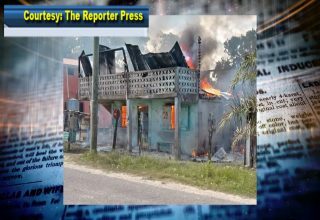 A Belize City family is homeless tonight after their home was destroyed by fire. 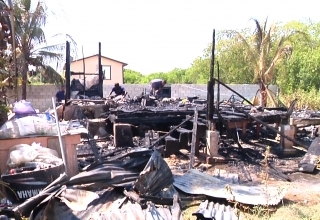 The bungalow structure on Fern Lane was gutted this afternoon during the blazing summer heat. 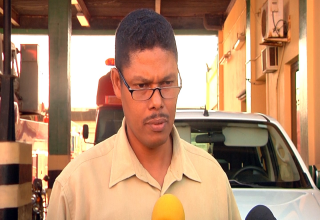 Love News spoke with Ezbert Ramclam, the distraught home owner, about what transpired. Ezbert Ramclam Fire Victim: Me and my girl were upstairs and we smelled like something is burning but we weren’t really paying it mind for the first because things are always burning around here like bush. When we really smelled something burning we ran downstairs and when we looked we saw a chair that was under the house bottom; there were big flames in it. My girl and I me and ran there to try pull it to the back out more so that it doesn’t catch under the house fully. By the time we were pulling it I burnt up my hand and by the time we could return there, the fire was already really up heavy up in it and I run upstairs. When we ran upstairs we broke up all the pipes water start flow in the whole house; we got some sheets; big big sheets and start throw in the chair to make the fire slow down but everything we were doing the room started to blaze up and by the time I pulled down one of my flat screens that was on the wall the whole house filled with smoke so I didn’t get time to move anything else. The only thing I could have saved was one television. I didn’t have time to save anything else and I am glad the breeze was blowing in that direction. If the breeze was blowing in this direction my mom’s house would have gotten burn too. The house was occupied by Ramclam and his common-law wife and their three sons. The family would appreciate any assistance the public can offer. 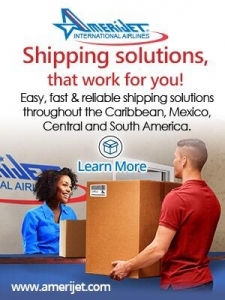 You can contact them at telephone number 602-7962. Previous article Be a tourist in your own country!